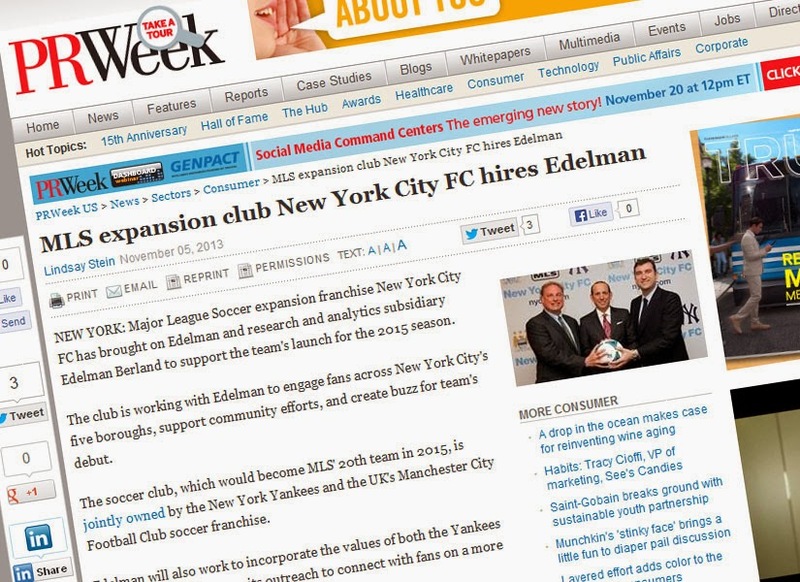 NYC is Blue: PRWeek: "MLS expansion club New York City FC hires Edelman"
PRWeek: "MLS expansion club New York City FC hires Edelman"
Today, as New Yorkers head to the polls to elect our next Mayor, comes word of a new hire for NYCFC. 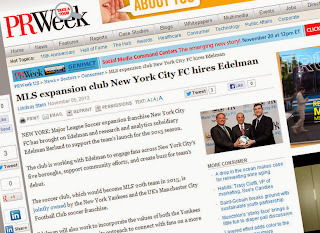 NEW YORK: Major League Soccer expansion franchise New York City FC has brought on Edelman and research and analytics subsidiary Edelman Berland to support the team's launch for the 2015 season. The club is working with Edelman to engage fans across New York City's five boroughs, support community efforts, and create buzz for team's debut. The soccer club, which would become MLS' 20th team in 2015, is jointly owned by the New York Yankees and the UK's Manchester City Football Club soccer franchise. Edelman will also work to incorporate the values of both the Yankees and Manchester City into its outreach to connect with fans on a more intimate level. “New York City has built so many great sports teams, and both the New York Yankees and Manchester City have a tremendous history of accomplishments,” said agency president and CEO Richard Edelman, in a statement. The team is still without a home. In August, the club reportedly filed plans to build a soccer stadium in the Bronx near Yankee Stadium. Residents and elected officials had previously objected to the club constructing a stadium in Flushing Meadows-Corona Park in Queens. 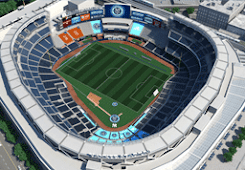 Edelman Berland is working with New York City Football Club on research initiatives to help the franchise understand the soccer market in New York and build its fan base. Additional information about the account was not disclosed. Last month, New York City FC hired Droga 5 as its advertising AOR, working on fan activation and engagement projects. Retired English soccer superstar David Beckham will work to establish a team in Miami in coming years that would become the league's 21st club, according to the Associated Press. I know it's frustrating from the outside, not to know what's going on with the club, but it's good to see that they're continuing to ramp up its operations.